Recently I identified a peony that has been perplexing me. When it bloomed for the first time several years ago I expected to see the dark red flower of Paeonia lactiflora ‘Black Beauty’ (Nightlife Peony). A rich pink double bloom, lovely in its own right, greeted me instead. The plant, I believe, turned out to be Paeonia ‘Madame Emile Debatene,’ hybridized by Dessert-Doriat in 1927. I cut this and several other peonies in bud and have been storing them in the refrigerator for a couple of weeks. Today this one appeared eager to make its way out of cold storage and into the world. The peony is paired with a branch of gardenia, laden with promising buds. 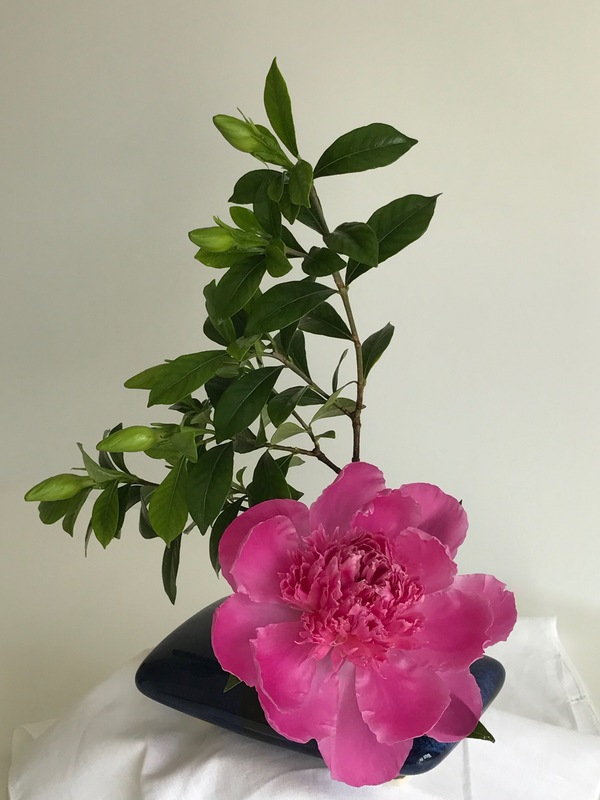 This entry was posted in garden and tagged 2017vase, flower arranging, flower design, gardenia jasminoides, in a vase on monday, nature photography, Paeonia x 'Madame Emile Debatene' on May 22, 2017 by pbmgarden. Lovely! And your Gardenia looks so healthy! The gardenia is full of buds. Can’t wait for them to burst open. Beautiful peony! I am so envious. I will have to try putting some off my peonies in the fridge next year. My were here and gone so fast because of the high temps we had at the beginning of May. Thanks. This technique works pretty well. We’ve had high temps too. Just as the peonies were about to open our weather turned severe–cold and rainy. So this way at least a few were protected. 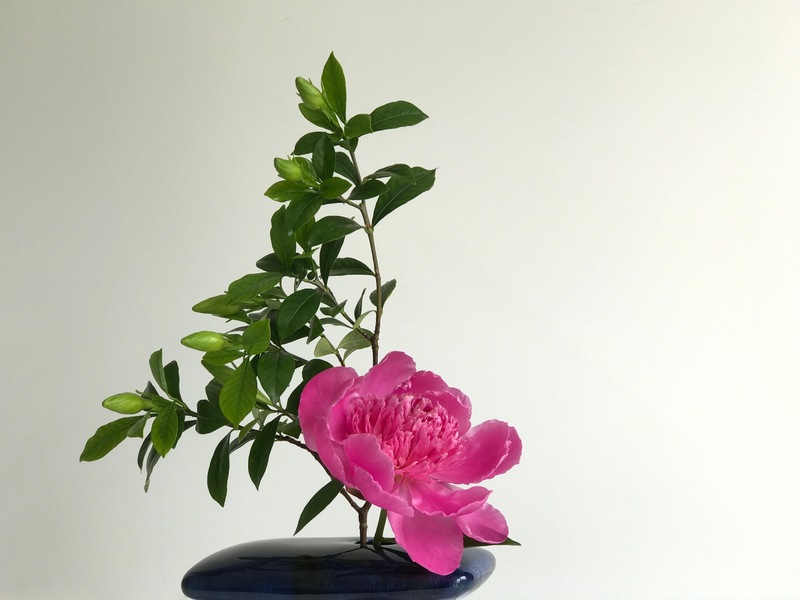 Simple and elegant, Susie, as befits the beauty and dignity of both plants. Peonies remain my own garden’s holy grail. It’s a stunning flower and wonderful with the glossy leaves. Ours have lasted quite well this year but that’s a clever tip. Thanks Alison. The refrigerator trick worked great for extending the peony season. Very pretty! I didn’t know you could keep them that long in the refrigerator! It looks so fresh! How long do the buds take to open once brought out of the cold? 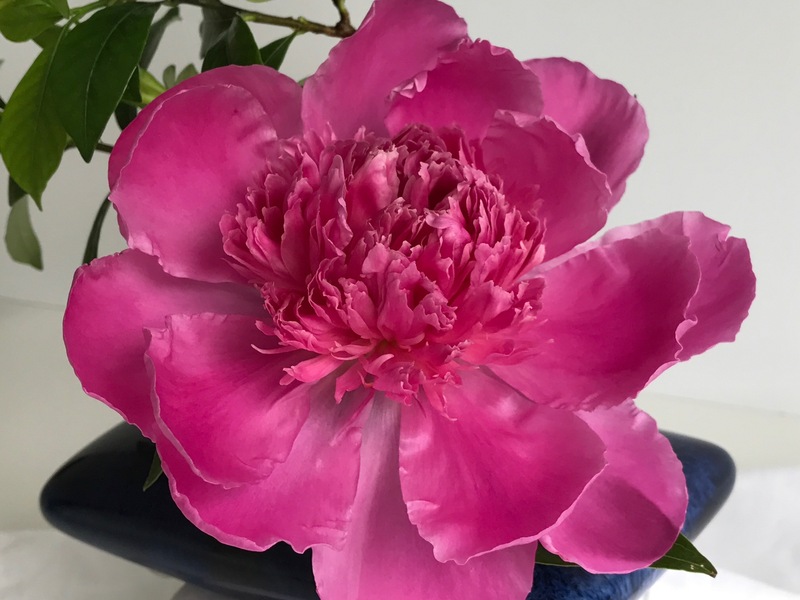 Cathy, one of my peonies opened within minutes of bringing to room temperature. The other opened more gradually to fully open with 6-8 hours. Quite a variation. Cathy, I haven’t tried the cold storage for other flowers than peonies. Really worked well for them. Pick at “marshmallow” stage, place in water, cover loosely with plastic wrap. Bring out when you’re ready. This one was beginning to open some in the fridge and it popped open quickly after being brought to room temperature. Another one took 6-8 hours to fully open. Such a perfect bloom! Nifty vase, too. Thanks Eliza. The vase is so versatile, I reach for it often. I like the form of this peony. Proof positive that “less is more”.